Evergreen with an open habit and medium sized, glossy dark green leaves. Loose trusses of large funnel-shaped, pale primrose yellow flowers, orange-yellow in bud, in mid spring. 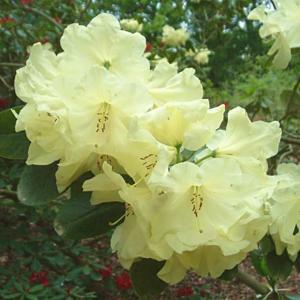 One of the best yellow hardy hybrids. Exbury hybrid of Rh 'Lady Bessborough' x R. wardii.